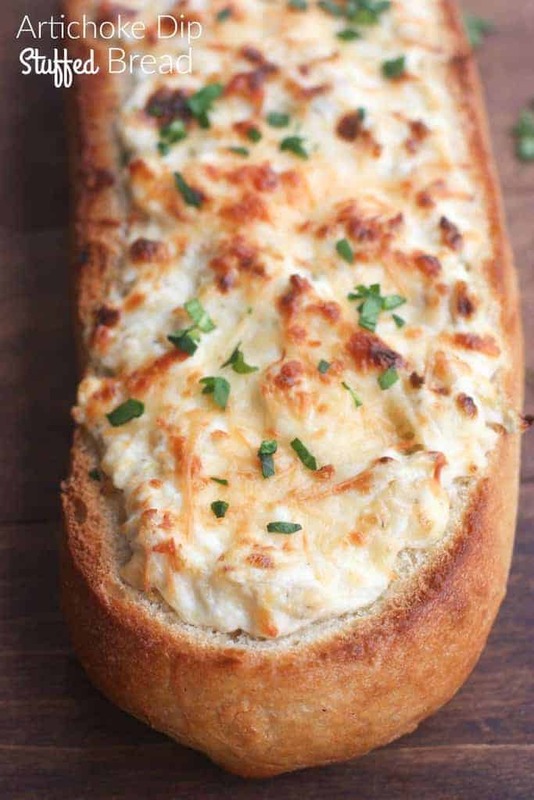 Artichoke Dip Stuffed Bread – our favorite hot artichoke dip recipe stuffed into a delicious crusty baguette. Makes a great, easy party appetizer! It’s officially the only time of year that I enjoy watching football! haha. I’m not the kind of girl that likes to sit around on a Sunday night watching sports. However, if it’s a team I feel a vested interest in (GO BYU Cougars!) or if it’s the playoffs, I do enjoy watching. And the Superbowl is obviously my favorite! Friends, good food and trivia games makes it a party every year at our house! We always make a bunch of party appetizers to enjoy during the game. You can find all of my favorite party appetizers listed HERE. I usually always make my favorite hot artichoke dip and serve it with crackers, but this year I thought it would be fun to stuff it into a crusty baguette. I gotta say, I may never go back to the chips version! YUM! 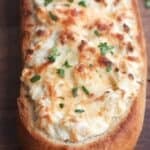 Artichoke Dip Stuffed Bread - our favorite hot artichoke dip recipe stuffed into a delicious crusty baguette. Makes a great, easy party appetizer! This recipe is amazing. I’ve made it for several get togethers and everyone raves about it. Sadly, it’s so good that could eat the whole loaf myself! This was FANTASTIC! So great in fact, that I decided to take a chance on changing the main ingredients slightly, to create another hot dip inside the bread! Four seeded & diced jalapeños instead of artichokes or spinach. I added in one cup Colby-Jack Cheese to your ingredients & removed the mayonnaise. Those were my changes to create a delightful mildly “hot” & cheesy bread that would go great at any party served with guacamole salad & chili con carne. Thank you for creating this incredible recipe, which lends itself well to everything from changes like; fruits & marscapone inside of a boule, to the one I had made!